Home Health Can Dogs See in the Dark? Do Dogs Have Night Vision? 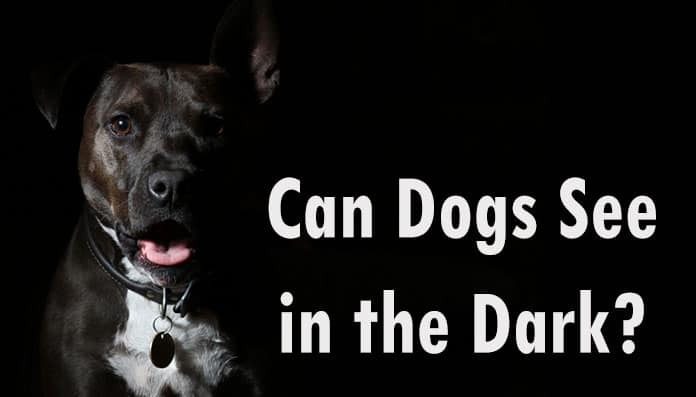 Can Dogs See in the Dark? Do Dogs Have Night Vision? ​The brief answer is: ​​Dogs have a good night vision and can see better in low light situations or dim lighting than humans but can't see anything in pitch dark. ​​People know sight as what we see when our eyes are opened. There’s a lot of myths about dogs seeing the world in black and white or that they’re colorblind or can’t see certain shapes. So, let’s understand what vision actually means first. The Canadian Veterinary Medical Association lists the following as the key pieces of vision: perceiving light and motion, visual perspective, field of view, depth perception, acuity and color. How Has Evolution Played a Role? 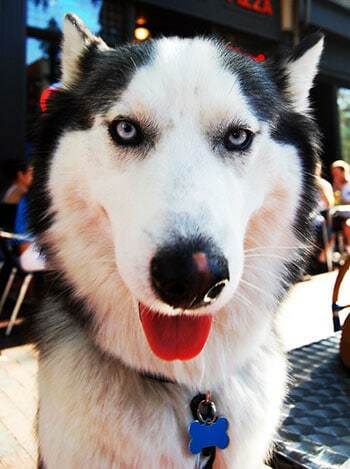 ​Canines have evolved to be “crepuscular.” In other words, they are most active when the sun rises and sets. So, while they’re not truly nocturnal, dogs need to be able to see in dim light to catch their prey. This means dogs evolved to see in the dark. So there’s no question really of “can they,” but more of how well they can detect movement in the absence of light. What is the Structure of a Dog’s Eye? ​Anatomically, a dog and human eye aren’t really that different. This means that we have all the same stuff: the cornea, pupil, retina, lens, and the rods and cones for color and light interpretation. ​Most mammals have larger pupils than humans do. This enables them to capture more light and see better in the dark. The positioning of a dog’s eyes, forward-facing and not off to the side (the difference between predator and prey), means they have limited peripheral vision. That being said, most dogs have a 250-degree field of vision compared to our measly 190-degree​ vision. However, dogs do not have the same binocular—where the eyes intersect—field that humans do. Some breeds, like Golden Retrievers, German Shepherds, and Labradors, are bred for their nearly human binocular field, which is what makes them excellent guide dogs. Dogs have more rods, the detectors of light, than humans, but we beat them in cones, which aid in seeing detail. 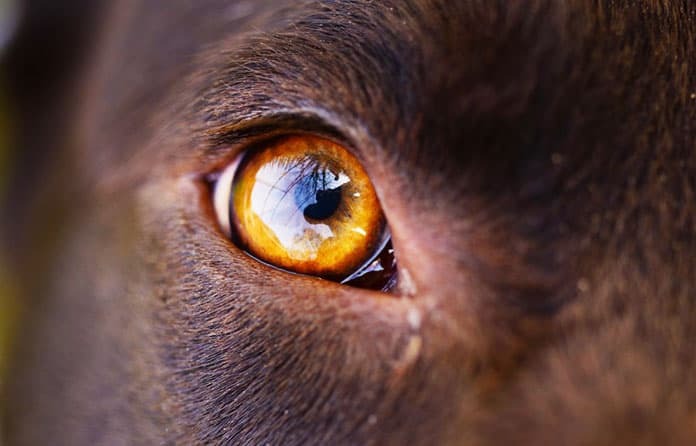 In fact, dogs have no fovea, so their eye for detail is 6 times poorer than ours​. ​Dog's Night Vision: How Do Dogs See in the Dark? ​So what gives Fido his edge when it comes to night vision? There is more to it than big pupils and an increased number of rods. Rather, it comes down to two things: the Flicker Fusion Frequency (FFF), and the tapetum lucidum. The Flicker Fusion Frequency describes the ability of the eye to see light after there is no longer constant illumination. This capability correlates with an animal’s speed. The faster an animal moves, the higher its FFF. Dogs move faster than humans, so they pick up more light than we can. This also means that dogs can detect movement better than we can. For example, people don’t generally see the flicker of their TV screen, but dogs do. Many of us comment on the eerie glow that comes from our dogs’ eyes when we photograph them with flash on. Thank the tapetum for that. All that light that might blind us temporarily is actually bounced off the tapetum and reloaded into the retina. This gives the photosensitive rods in your dog’s eyes another shot at capturing and processing light. But that’s not all. The tapetum lucidum doesn’t solely reflect light, it alters the wavelength by amplifying it “through a photoelectric phenomenon called fluorescence,” states Stanley Coren, a dog expert. “The color shift moves the wavelength” closer to the rods that are sensitive to that kind of light. The cost of this, though, is poor attention to details. You see, the “light [hitting] the reflective surface in the back of the eye comes from various directions,” and is “like a pool ball hitting the bumper edge of the table,” explains Coren. Details get blurred. This is why the movements we make, as well as our body language, makes us more recognizable to our dogs rather than the actual features on our face. ​As long as there is the faintest glimmer of light, then yes, dogs can see in the dark. Dogs can pick up more light than the human eye thanks to their abundance of rods, a high FFF, and the tapetum lucidum. Aren’t dogs amazing? We’d love to hear your thoughts below!